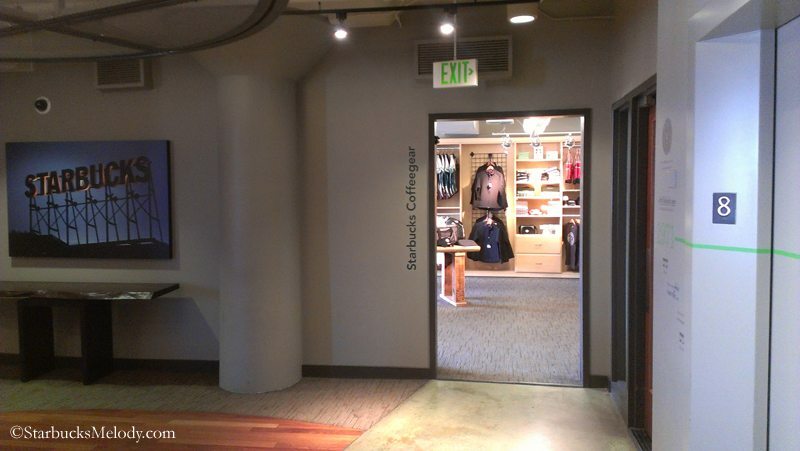 The Starbucks Coffee Gear store is open to the public, and located on the eighth floor of the Starbucks headquarters. The address is 2401 Utah Avenue South, Seattle, Washington, 98134. 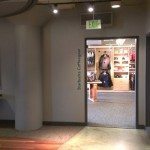 Yes, you should visit next time you’re in Seattle! 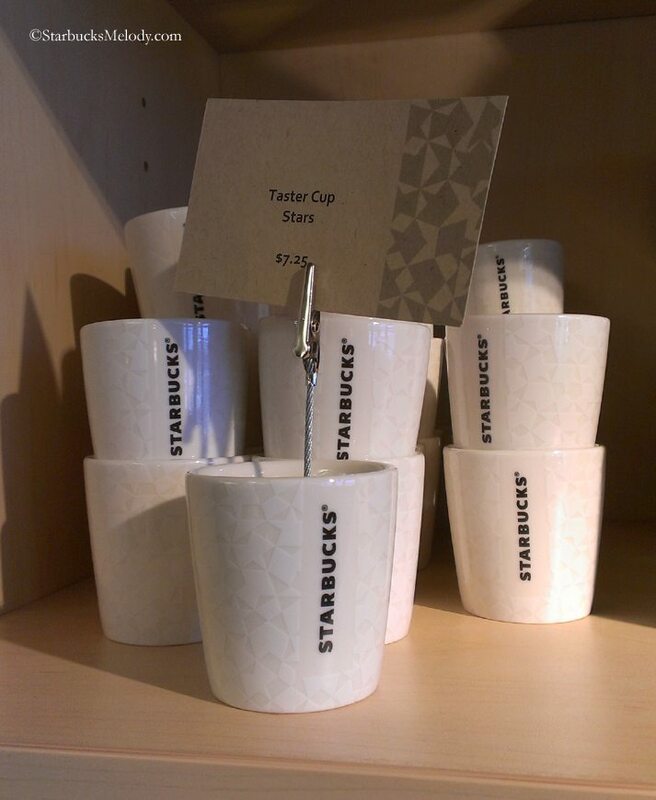 When you go to the Starbucks Coffee Gear store, you’ll find unique merchandise items not sold anywhere else. 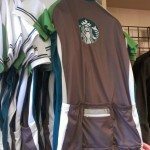 (If you are a partner, you can buy most of the merchandise online at http://www.starbuckscoffeegear.com/). Once every few months, I drop by to see what’s new at the store. Their merchandise changes frequently. 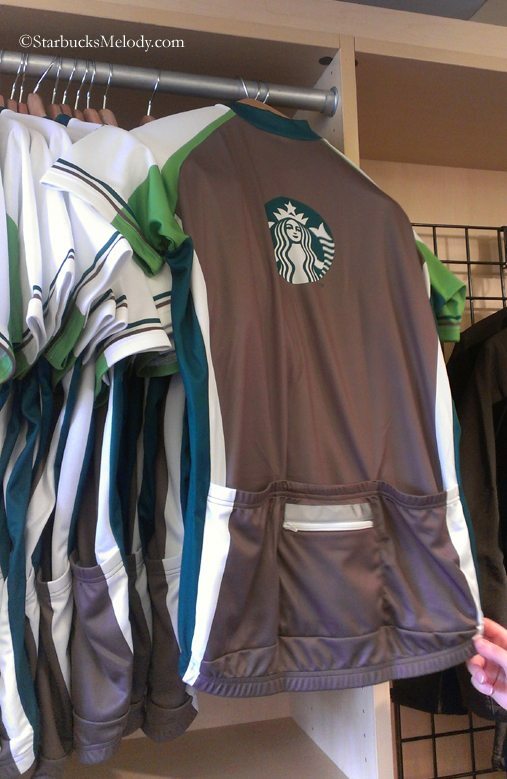 The Starbucks cycling jerseys seem to be in stock year round. 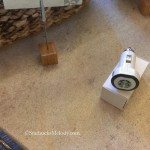 You can browse all my articles on the Starbucks Coffee Gear store here. The one item that jumped out at me as being a super cool new item was the Starbucks logo grocery sack made from recycled bottles. I bought one of them at the end of February, and used it right away at the grocery store! 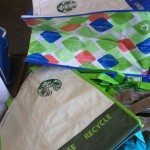 As everyone knows, just as it’s the green thing to do to bring your own cup to Starbucks, it’s also “green” to bring your own sacks to the grocery. And here in Seattle, there are no plastic sacks at the grocery store (banned by city ordinance) and you get charged for having not brought in your own bag. It’s usually about five to ten cents bag charge, however I think the merchant can legally charge you a 25 cent fee for needing a paper bag at the grocery. I love this grocery sack. It’s strong, large, and works great at the grocery! Looking at those iPhone covers almost makes me wish I had an iPhone, but I really like my Android. I think I prefer the black stars pattern one. I have fabulous prizes to giveaway, courtesy of the wonderful people who run the Coffee Gear Store. You’re entering to win two great bags – One is the “Cape Code Tote.” That one has the logo on the front, and it’s a nice sturdy canvas bag. It’s an item that is not being re-ordered, so it won’t be available much longer. 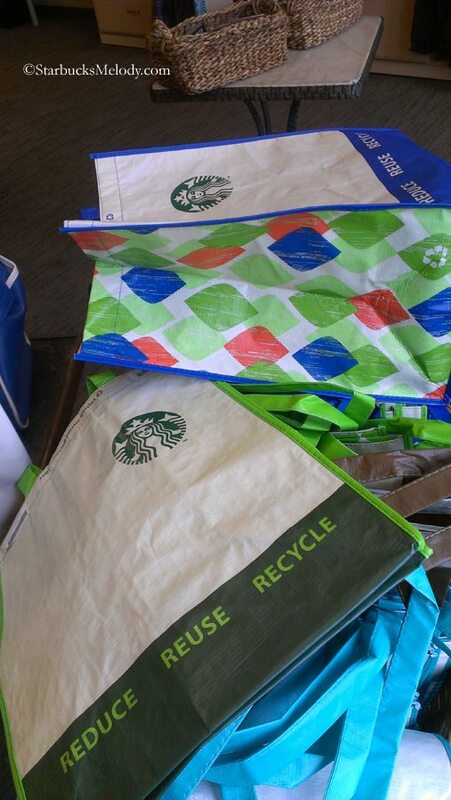 The other is one of the new Starbucks logo grocery bags made from recycled bottles. These two bags are super handy and your friends will be jealous! 1. 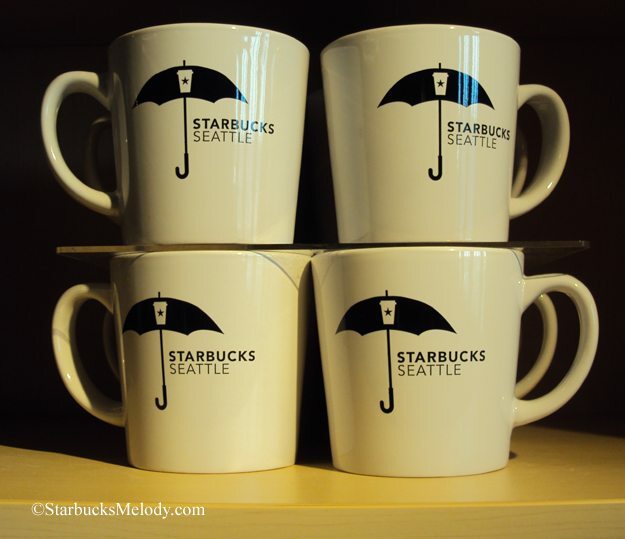 Leave a comment below – You must tell me what merchandise you really want to see at Starbucks. This is your chance to be creative. If you want Starbucks snow globes, playing cards, or more holiday collectibles, please don’t hold back! What Starbucks logo merchandise would you want to buy? 2. One entry per person. You must be over age 18 to enter. 3. There will be one winner, based upon the number of entries. The winner will be picked at random. 5. You must have an address within the United States. 6. 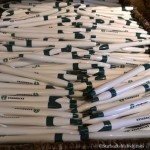 While it is not mandatory, I would hope that you would “like” the StarbucksMelody.com page too. Please bear with me. This will definitely be a test of my newly-installed comment system. I have noticed that the number of comments in the napkin icon is not updating regularly, but you can always look at new comments in the right rail column. Give me a few days to draw a winner. 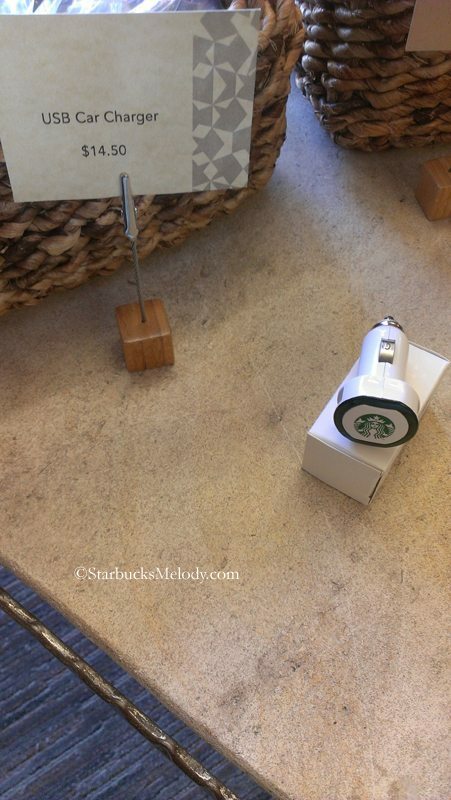 Your prize will be mailed directly to you from the Starbucks Coffee Gear store. As always, sending me an email, or leaving a Facebook comment is not a valid entry. It must be an actual comment on the blog. FTC required disclosure: This giveaway is sponsored by the Starbucks Coffee Gear store. Thank you so much for offering to do this! I would love to see t-shirts in our local stores. It would be fun if they were specific to the area too like the mugs. Oh gosh, I’ll try my best to keep this list short! Do you guys remember those little, cylinder, neon containers used for lunch money, arcade tokens, quarters, etc. that kids/teens would hang around their necks in the 90s? Something similar for VIA to be kept in on the go would be cool. Also, you know how there’s a stand/dispenser (like the carousel design) for K-cups? I think something similar should be made for storing your assorted VIAs on the kitchen counter, in an attractive fashion. 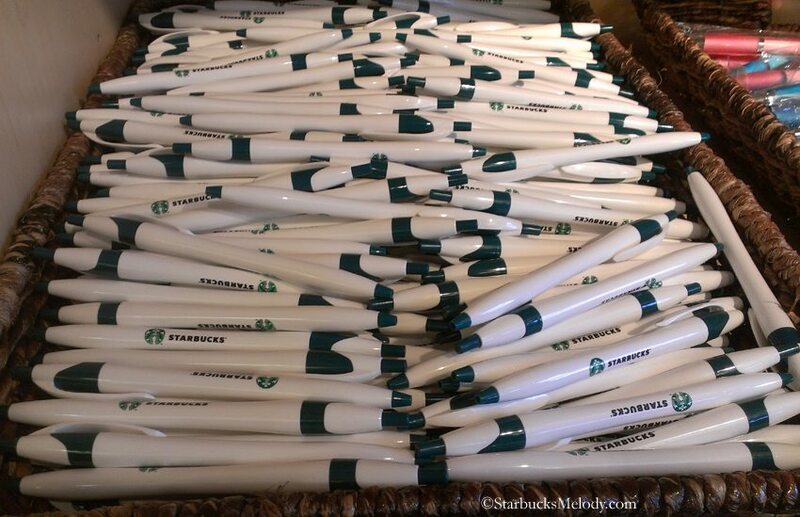 I would love to be able to buy Starbucks-branded pens, notebooks, notepads, office supplies, stationary in general that’s fairly priced like the one dollar reusable cups. 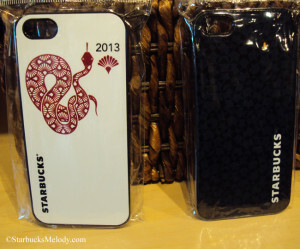 Siren Earbuds & USB cords, iPad accessories would be fun to use & show my love for Starbucks. More kitchen storage items would be nice, such as trendy canisters to store sugar, coffee, tea, etc.. I love the playing cards idea that Melody mentioned, I would totally buy those. Key chains, coin purses, & charm bracelets w/ different modifiers & drinks as charms to collect and complete your favorite Starbucks drink on a bracelet. How cool would that be?! I love how I can buy their syrups, but it would be great if they sold mini green & silver whipped cream dispensers. More espresso shot glasses & demitasse cups sold either individually or in a set w/ small plates, etc. would be wonderful. 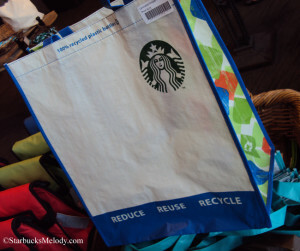 These bags, both the canvas & reusable grocery one, are so wonderfully practical & useful, it be great if they’d make & sold affordable ones at each store to help w/ customers (& Baristas) be more Green. I would love a Starbucks umbrella, a large one and a compact one. One to store in my vehicle and one for my office. I totally like the idea of Starbucks logo umbrellas too. They sold one at the coffee gear store a few years ago. 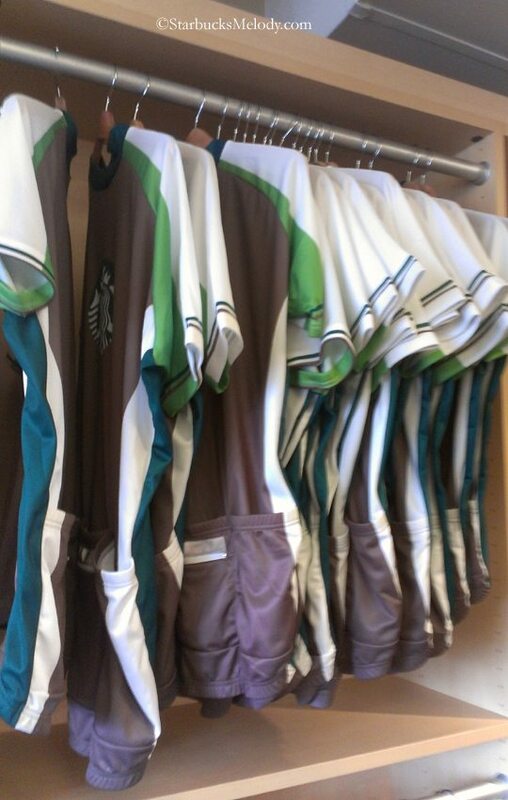 It was green and white with the logo – very nice! Melody and Brad still having problems with getting comments on a regular basis to my inbox. I would love to see kids/baby stuff! 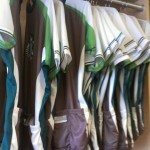 Would like to see cycling shorts, mousepad, cool artwork with black/white photos of things coffee related. I really like the idea of snowglobes haha!! I haven’t been particularly pleased with the past couple Christmases at Starbucks, I think there needs to be a little more variety. Organic cotton tshirts or sweatshirts. 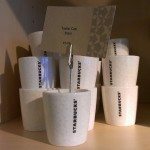 Starbucks printed media like books, notebooks, calendars, etc. I remember they had crosswords a few years ago. Okay, I think this is the complete list of entrants. I hope to announce the winner no later than Friday, and then I will let the coffee gear store know too. 37. Rachel (Timbuk2 messenger bag). Oh, wow!! Thanks so much!! Hello. 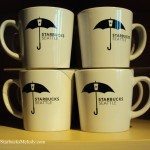 How do I get hold of one of those heavy duty Starbucks patio umbrellas you see outside of their stores at various locations? One would look really cool on my deck. Inquiring about a Green Patio Umbrella-availability?? Patio umbrella?? I really want to buy one.